Instrument Mounting Declination hub has ten 3/8-16 tapped holes on a 12.000" bolt circle. Capacity Conservatively rated for 300 lbs (not including counterweights). Please feel free to call and discuss your application with our staff. Counterweight Shaft 2.5" (6.35 cm) diameter, 31.5" (80 cm) total length, 30" (76 cm) useable, 42 lbs. (19kg). Twelve of the optional 30# counterweights will fit onto this shaft. Includes large, machined safety stop. An optional shaft extension (M3655) is also available. Diameter of Base 11.480" (29.16 cm), fits into 12 " outside diameter pier with 0.25" wall thickness. 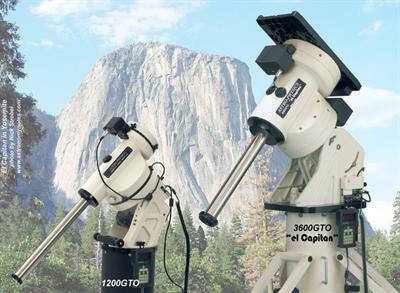 Click the button below to add the Astro-Physics 3600GTO German Equatorial Mount with Precision Encoder to your wish list.